• Enjoyed a semi-drunken evening playing Last Night On Earth - The Zombie Game with friends. • Sat in an IHOP and debated snapping photos of the ravens flying around outside to show author P.T. Michelle. • Spent an hour at the pediatrician's office trying to get my kid to give a urine sample. • Felt ridiculously sad that I can't afford to give Espionage Cosmetics all of my friggin' money for their Ice and Fire and Paranormal collections. • Finally found and purchased a bottle of Angry Orchard Iceman and Muse, because seriously, who doesn't like apple wine? • Cursed at the snow coming down outside. Twice. • Sent out the three seriously awesome goodie packs from the Spring Fling Blog Hop -- wanna know who won? The winners are up here. 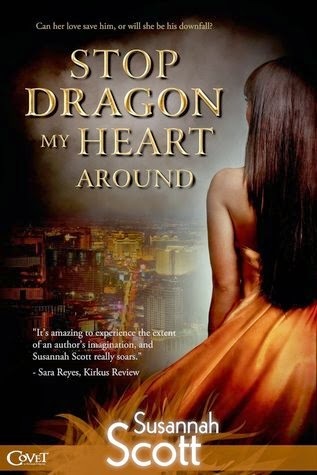 • Grinned every time I made coffee because the heroine of Susannah Scott's upcoming release STOP DRAGON MY HEART AROUND likes the same coffee that I do. • Spent a little too much time blushing through this post at Buzzfeed. I would love to help #50 with his lip biting. • Wangsted about Game of Thrones a lot... because I'm audio-reading Game of Thrones, playing the stupid Ascent game on iPad, and of course #PurpleWedding. • Realized I needed to write a Weekend Reading post—because I try not to go too many Fridays without one—and almost cried. • Decided to do a flash giveaway to any of you who actually read this gawd damned post and post a comment related to one of the above events from my week AND what book you're currently reading. I'll gift 1 Kindle copy of Dark and Deadly to one random.org selected commenter on Monday morning (make sure you leave an email addy so I can find you). You lead an interesting life, Rhianna. How's the audiobook version of GoT? It's very impressive. The narrator does annoy me because he frequently mispronounces character names (ie. he says Catelyn at least 3 different ways). But that aside, it's really interesting to get some of the details that a show just doesn't need to cover as well as see how closely it does indeed follow the books. I think it's a good example of when an audiobook is worth the cost of an audible subscription. The novels run from 700-1200+ pages and while I love epic fantasy like that I just do not have the swift reading skill to get them read. But they do make for great stories to 'read' while I do dull, mindless chores like folding laundry or cleaning closets or even certain cooking/baking projects.